LEAWOOD, KS (December 21, 2015) – CARSTAR Brunswick owners Jeremy and Theresa Orsky are quickly growing their collision repair business in the Cleveland, OH area. Their first shop, CARSTAR Coach & Collision, opened in Cleveland, in 2012. They expanded to a second location, CARSTAR Tim’s Collision, in Twinsburg, OH, in late 2014. Now their third shop, CARSTAR Brunswick, located at 1191 Pearl Road in Brunswick, OH, is completely remodeled and open for business. The Orskys have spent the past few months renovating their new shop with a complete makeover of the customer and front office area. Everything from the floor to ceiling has been upgraded, including a new counter, reception desk, customer lounge, paint, fixtures and CARSTAR custom branding. When Jeremy Orsky found his latest shop, he actually wasn’t looking to expand. When he was shopping ads on Craigslist for equipment or potential business opportunities, he ran across an ad that grabbed his attention. 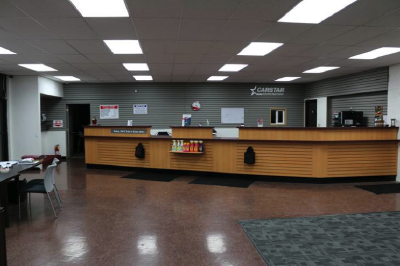 CARSTAR Brunswick is in an 11,000 square foot shop, that sits on a two-acre fenced-in lot. It is a perfect compliment to the Orsky’s other two locations. While all three shops are fully capable of performing high-quality collision repair work, the Orsky’s are now better equipped to load level their work depending on the type of repair. Their flagship location, CARSTAR Tim’s, is a 25,000 square foot I-CAR Gold certified shop which also carries all of the OEM certifications. That is their central location where specialty work, like aluminum repair, will be sent. They are also set up to handle mechanical work at that shop. The Orsky’s CARSTAR Coach and Collision location is currently finishing up a similar renovation to what was just completed at the Brunswick location.